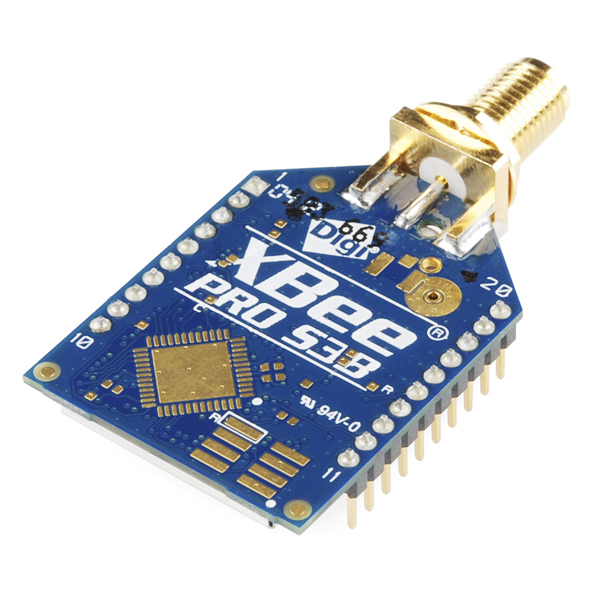 The XBee-PRO XSC 900 MHz RF module features two times the throughput and 20 times less current draw than the previous XSC module, making it ideal for long-range sensor applications. The RF module features an ADF7023 transceiver from Analog Devices, delivering distances up to 28 miles Line-of-Sight with the right antenna, along with low power consumption, drawing less than 2.5 uA in power down. 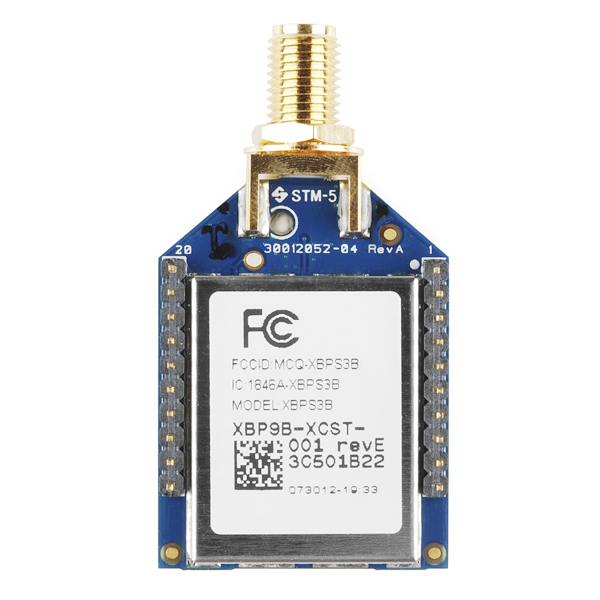 XBee-PRO XSC modules operate within the ISM 900 MHz frequency band. The modules are optimized for use in US and Canada. This is a nice part and it's good to see Sparkfun selling it, but at Digikey it only costs $42 apiece, so why the huge markup? Sparkfun, do you sell any 900MHz wireless modules that can be shipped to other countries ? Does this unit work properly with the sparkfun Xbee explorer? 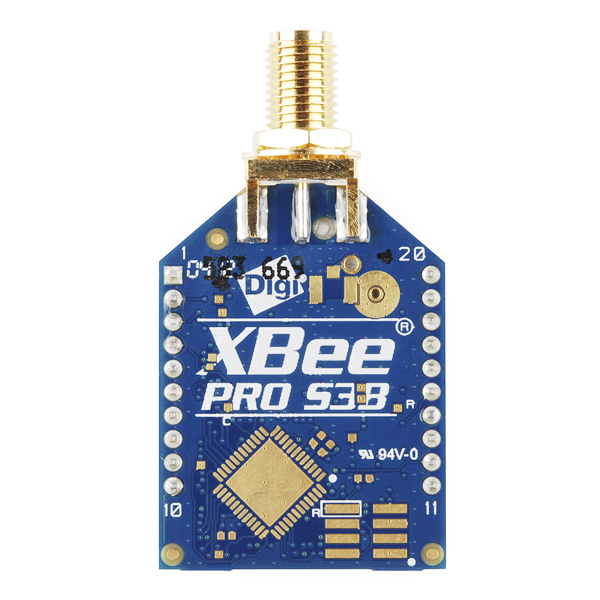 I would like to improve the range of my XBee S1 w/ chip antenna. Can I simply swap the XBee modules? I already have Xbee Explorer USB and XBee Shield. (I understand I will also need an antenna). I recently purchased two of these and attempted a range test with the X-CTU software. However, I had 99% packet loss. I was using the usb dongle (https://www.sparkfun.com/products/9819) to connect to the X-CTU software. I used the 900MHz duck antennae for both radios. Grateful for any ideas people may have on this. Exact same problem here. I could not configure the radio through XCTU or tera term. I removed the LED and all that mess, but still no luck. I noticed most of the AT commands were returning errors in tera term so I gave up and returned to the Series 2B's. How difficult (or even possible) would it be to have this connected to an Arduino Micro? And, I don't care if Sparkfun charges twice as much as digikey for this. The vast amount of information and education that I get for free from Sparkfun makes it worth supporting them. Can this modeule be connected to IOIO? I should note from vast experience with these modules (have had almost all of them through my hands, including the Xtend): "The right antenna" and "High gain antenna" here just means a very directional yagi. In other words, the stated ranges generally only hold true for around 10x less range with a omnidirectional (normal) antenna. An omni directional antenna will get the same ranges as a yagi. You just need to purchase an omni with the same gain (db) as the yagi. The higher the gain the larger the cost separation between omni and yagi. Given antenna gains are volumentric functions, truly omni antennas are impossible at high gains.